You may recall that I set myself a goal of cycling 5000kms this year ... or not. It was a goal that I went somewhat silent on after a few months, but I never actually abandoned. I failed by about 1,200kms or just 3.3kms a day. Seems so easy when you think of it like that. The good news in my failure is that I did ride a lot further than the year before, but a failure is a failure ... or is it? I like the idea that it's another way step towards success, so I'm going to go for it again. January 1 2017 tomorrow. Strava clock reset: 5,000kms here I come ... again. Short note: This post won't make sense unless you've already read the previous post here. So it rained all night. I mean it really rained, and without much motivation, or need, to get out and do anything today given yesterday's events, we had a fairly relaxed morning including a fantastic breakfast of home preserved fruits, yoghurt and local jams on toast. It could have been that the "On The Terrace" owner did us a favour by cancelling our booking! With no clear destination in mind, we drove out of town (in the rain) and on a whim I drove down to Forest (it's the name of a town) to check out the local primary school (long story, but it's got to do with my work) then we headed into Smithton with the vague intention of maybe driving down to Edith Creek, however as we refueled at a (seemingly abandoned) Caltex on the outskirts of town, Kim's motivation to maybe look at the Rocky Cape Track (combined with her complete disinterest in checking out school bus routes) returned so we did a U turn and headed back that way. It was somewhere around this point that Kim confided that her main concern with running the track was that if she went by herself she might get lost on the route through Rocky Cape, especially in this weather (it was still raining hard and there were low clouds) so we pulled into the Rocky Cape Road house and after 30 or 40 minutes of dithering around on her stupid android based Samsung stupidphone and one bar of Tesltra reception (if we held it up against the window), we finally managed to download Gaia GPS onto her phone, send the gone nuts route from my iPhone to her phone and then figure out how to get it to display on her phone so that she now had a route to follow. (Except I don't have any photos of that moment as it was raining and I didn't want to get out of the car and get wet, so the above is a photo of her near the end of the walk). I then drove around to Sisters Beach and walked out to meet her as she came down onto Anniversary Point. This wasn't just me being a good boyfriend, Kim had read in the trail notes that it was hard to find the track at the end of this beach and not wanting to get lost had 'requested' that I meet her there. As it turns out (with the benefit of 100% hindsight) it was very easy to find the track (it was signed off the beach) but I had such a nice walk out there that I decided not to say anything. We got back to the car about 2pm or 2.30pm (I think) and Kim made the call that she was too wet and cold to do the section around to Boat Harbour beach (although we drove as much of it as we could, and having since read the trail notes I think we should have covered that section - although we can always cover it the day before the race). 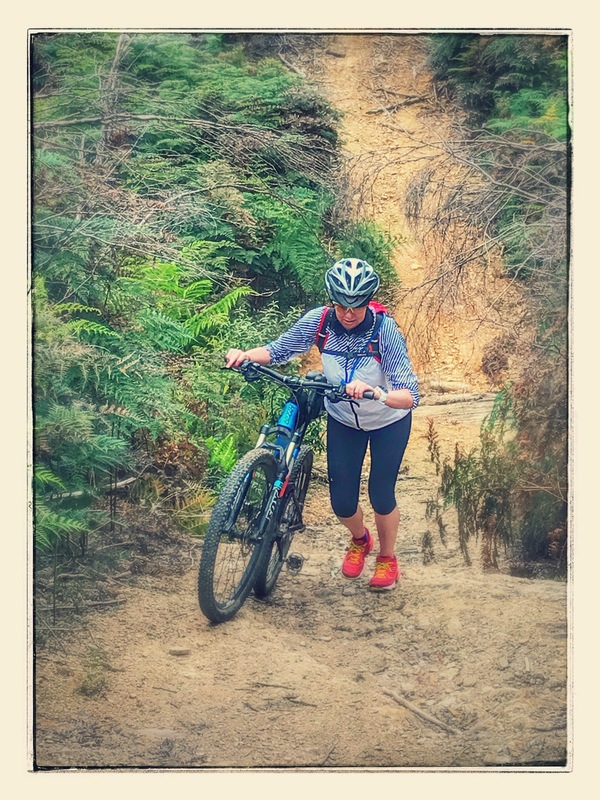 The big news was this - somewhere between Rocky Cape and Sisters Beach, on a rain sodden, cloud covered track, Kim had decided that maybe she did want to do the 101km race after all. She confirmed what I always suspected - she's gone nuts! So we went for a drive (in pea-soup think fog) along the road to Table Cape noting where the trail sort of went and that the section of the trail coming into Wynyard was actually closed due to the recent floods before checking into to our adequate (but not very exciting) accommodation at the Wynyard Waterfront Hotel. Not much to say from there, we both had a hankering for Chinese so went to one of the worst Chinese Restaurants we've ever been too (the Beijing Restaurant in Somerset where the food was average and the service so bad that they took our meals before we had even finished eating them - because the wait staff wanted to finish at 7.30pm). Then the next day we just drove home, and somewhere along the way - it stopped raining. So ... Kim has gone nuts. Specifically, she's gone nuts thinking she can run (like, with her own feet) 100kms. Even more specifically, she's thinking of running 101kms in the Gone Nuts101 trail race in February next year. I know: it is hard to be a supportive boyfriend in these modern times, but I acquiesced to her demands, and agreed to spend three days up north staying in a luxury B&B in Stanley and riding beaches, hills, and trails - all so she had some idea of the course ahead of her on race day. At least that was the plan when we left Hobart. Somewhere around the 40 to 45km mark on the course, that story had changed to her deciding that there was zero chance of her ever wanting to even enter the gone nuts race, and that the course director must have been some sort of masochist. Which was just after we'd got to the top of yet another impossible climb only to see more impossible descent/ascent combinations stretch out in front of us. But I get ahead (way ahead) of myself, so let's go back to the beginning. The plan was to spend three days scouting different sections of the course staying at the rather nice looking "On the Terrace" B&B in Stanley. But then I got a call on December 23 from said accommodation to tell us that they had 'mucked up' our booking and so we had no where to stay (read that someone with a longer five day booking needed our room and so they were unbooking us, despite having confirmed our booking through booking.com and there being no where else in Stanley for us to stay) . The owner didn't even apologise or offer any alternatives, and in fact their whole conversation was about how hard it was for them as a small business managing their three rooms, and how I should feel sorry for them. And here's an interesting fact: if the B&B owner unbooks you from your booking on booking.com, because you therefore have no booking with them ,you can't leave a review voicing your displeasure, even though they shafted you. Who knew a booking website would work like that? Booking.com, to their partial credit, offered me a refund on any extra costs I had in booking replacement accommodation, but I say 'partial credit' because they only made this offer after I had already booked alternative (much cheaper) accommodation through them (one night in Stanley and one night in Wynyard which was the next closest available accommodation) and so they would have known that I had no additional costs. The second problem was the weather: the plan was to just drive up the first day, and then spend the next two days exploring the trails, but the forecast for our two main days of trail exploration deteriorated to 20mm to 40mm of rain per day, so we rejigged our plans and decided we'd push up to Stanley early on the first day and try and get the main inland section (the section from Black River to Rocky Cape or about km 17 to km 54) of the race out of the way before the rain came in. After the little driveway experience, we popped out on a road, and after a quick check of my map I told Kim that "it was all easy from here" and that it looked like we just follow this road until we got to the first checkpoint. Turns out that this was to be the first of many times that I would be wrong today. A kilometer or so down the road, this road (that we'd just follow) ended and after another, closer, check of the route it appeared it was time to jump on the (now closed) railway line - literally. It was a bit bumpy on the bikes, and a few too many thistles, but in the main it was an enjoyable little section of trail, though running it could be interesting. All too soon (though I don't remember thinking that at the time) we headed off the railway line and followed a parallel road out to what would be the first checkpoint at 25kms. From there, we were a bit worried we'd need to leave the course as the google earth imagery seemed to indicate that the course went through someone's house, however the trail does actually follow a road around the side of the house and off into the bush - it just doesn't feel like you're on a road as you ride along it. 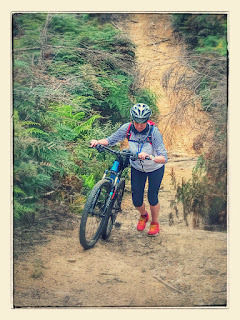 It was actually a really nice section of trail - to start with - but then it all got a bit monotonous with quite a lot of undulating climbs through less than spectacular harvested forest areas. Kim also got 'attacked' by a bull (I think it actually just stood up and looked at her the wrong way as we cycled past, but she swears she was attacked due to her red backpack and orange shoes and that as her boyfriend I should have thrown myself in its way). At least that's what I think she meant as she went pelting past me at a thousand miles an hour yelling "bull - the bull's charging me - bull! bull! BULL!!!!". Turns out it was far more promising than it looked. Now I will say at this point that I got the elevation profile / distance progressed a bit wrong, so whereas I thought we were heading over the crest of the 'big hill' we were in fact just setting off into the foothills. Remember how I mentioned earlier on that I got quite a few things wrong? Well most off them were my optimistic exhortations to Kim over the next five kilometers as I promised "once we get to the top of this hill / around this corner we'll be on a proper road and it will be all downhill". In case any prospective gone nuts runners read this, be warned that I was very wrong and the next five kilometres are a mix of leg, ankle and heart breaking ascents and descents and tree fall. Admittedly our little adventure through this section was made much harder with the bikes. Still, it was here, having slipped in a rut and had her bike land on top of her whilst pushing up a hill and then finding herself unable to get back up (for once I was actually a good boyfriend and headed back down and helped rather than just being my usual self and laughing whilst taking a photo) that Kim started saying that there was no way she was doing the 100km race. She even accused me of perhaps going off course, which I hotly denied (after checking of course). It wasn't a fun section, even the last descent was so steep that Kim couldn't stand properly (in her new trail running shoes bought specifically for this event), so I found myself hauling both bikes down the side of the hill (in my $89 shimano bike shoes). Go the cheapo shoes! You can't see how steep the hill is over that crest. We finally emerged out onto what looked like a real road and felt that relief you get when you know you're actually going to make it through ... and in this moment of joy, I promptly took off the wrong way for about a kilometre before I realised my error and had us backtrack. Really not what either of us needed at that point. But that was it ... once back on the right track, it was a fairly easy cruise out to the highway (at this point Kim was so convinced that she was not going to do the 100km run that we didn't even bother following the last section into the campground) and after a quick refill of cold cokes and gummy snakes at the United Petroleum place a couple of kilometres up the road, we killed the last 12 kms along the highway back to our car due to a nice 30-40km/hr tailwind pushing us along. We thought it would take us 3 or 4 hours to scout the course, but I think it ended up taking closer to 5 hours (including the ride back to the car) and we were both feeling a bit scratched and beat up from the days adventure. Just over an hour later we were, however, happily showered, in clean clothes and munching on fresh seafood in Stanley (we did manage to find a nice luxury B&B in Stanley, but just for one night The Ark Stanley which gets a 9.9/10 from me). Kim's two glasses of wine after dinner. It was here that we reviewed the day with a bit more distance between us and the unexpected steepness of the trail, but despite that distance Kim just got more and more certain that she was now only going to do the 50km run. This may have proven that Kim was in fact not nuts, but it left us with another problem - we now had two days left up here in the North West and as we no longer needed to scout the first section of the race we didn't really have much else to do other than check out the section through Rocky Cape to Boat Harbour. And that's where I'll pick up in the next post. Kim headed off with the kids today to help Antony move house, and so I was left with the request to just neaten the place up a bit if I had time as Bec and Anthony were coming around for dinner tonight. This was a reasonable request, so after walking the dogs and doing my weekly accounts, I went outside and mowed the lawns (I even mowed in front of the neighbours house which took longer than mowing our lawns), I raked up all of the loose leaves and dirt that had accumulated under our outside sitting area over the winter, I de-cobwebed and cleaned all of the outside seats and tables, I vacuumed the floors, I did a load of washing, I fixed a broken screw in one of the dining room chairs, I cleaned out all of the stuff from Kim's old car in case someone came around to buy it, I emptied the bins, the recycling container and the compost, I washed down all of the bench tops and tables and I even plumped the cushions in the lounge. It was a really windy in Lauderdale this morning, and so as I was driving into work, I decided I'd drive over the bridge to Cornelian Bay and just ride in from there (avoid getting buffeted by a side wind on the bridge). But then just as I was about to drive onto the bridge, I suddenly changed my mind and veered off towards Lindisfarne and parked at my usual spot. It was a weird little impulse, but as I pulled up to get out my bike it seemed like the right one as there was only a gentle breeze this far up the river. I was just about to ffire up strava and cycle off from my car, when a lady who had been sitting in a car on the other side of the car park opened her door and asked if I had some jumper leads with me. I didn't, and I told her so. She swore mightily to my answer and slammed her door shut again. My emergency car starter kit. A few months after getting a flat battery whilst charging my iphone from the car up at Arthur River, I had been buying some stuff from Torpedo7 when I saw this AutoSpark car start kit on sale for $80 and thought to myself "that would be useful if I ever get another flat battery" and clicked on "Add to Cart". It arrived, I checked it was charged and promptly put it under the drivers seat and proceeded to forget all about it. And having remembered it, I was still so tempted to just cycle off and get on with my day. I had to actually stop myself mentally, tell myself to do the right thing, get back off the bike, unlock the car, search for the kit (it was actually under the passengers seat) and then I went over to the lady (still sitting in her car) and explained that I had just remembered that I had this kit, I had no idea how it worked, but that we may as well see if we could get her car started. She was thrilled as she got out of the car, and proceeded to explain how she'd been there for what she thought was more than an hour, how she was eight months pregnant (I could see that she was), how she'd gone for a drive down her to go for a short walk (not sure if that is kosher, but it's her life) and how she had left her lights on resulting in her battery going flat. It was a good moment to know that I'd made the decision to stop and interrupt my life to help someone who obviously I'd have wanted to help if I'd known her story. I did finally get on my bike, and I did cycle into work. I just had a slightly bigger smile on my face than usual. We nailed the Bruny Island Ultra last year (you'll note how I say 'we' despite the fact that Kim ran the full 64kms and my role was just support crew). Heck, we even lined up eleven quolls as good luck charms. We got the running right, we got the accommodation right, we got the logistics right - we nailed it. We basically had a winning plan already written out for this year and all we had to do was follow it. Which, of course, we completely failed to do. Things went off track pretty quickly: The lovely AirBnB we stayed at last year wasn't available, and in fact the only place that was available on the Island was right down at Alonnah. Not ideal - and also quite expensive ($240 a night). But it looked great online, and so we both took Friday off figuring we could go down and get our monies worth lapping up a bit of luxury before the race. We were not impressed, and instead of lounging around in luxury we found ourselves shifting around on the uncomfortable couches wishing that it was time for dinner so we could get out of there. It was not an auspicious start to the weekend. But, we did manage to maintain our ritual of beer and dinner at the Bruny Hotel which was as good as it was last year. (PS. If you're wondering - no Kim never does get off her phone - I think she see's herself as a Kardashian). And then it was an early night, ready for a 3.45am alarm so we could get to the start by 5.30am. We didn't see any quolls this year on the way to the start either: but we did see a poor little pademelon get run over by the car in front of us. What was I saying about inauspicious starts? Unsmiley face. Now last year, I was at every 2km stop for the first 6kms checking Kim was OK, before waiting at the CWA Hall for a double bacon and egg muffin for her so that I could deliver it to her fresh on her run. Notice Kim down there at the start ..
Because that strategy has never gone wrong for me before. But the truth was that she was running up the hill almost as fast as I was riding up, and so I was very grateful to get to the top and tell her that I had better head off now so I can get back to the car and support her (while really just using the downhill section to be able to build up a bit of a lead). And this time (unlike previous attempts at incorporating a short bike ride into my support crew activities) I was still able to get back to the car, pick up Kim's egg and bacon muffin and still be back with her by kilometre 18. The rest of the race went like clockwork (from a support crew perspective - apparently the runner was in a bit of pain), which tells me that maybe I'm getting this whole thing sorted out and there is room for a bit more risk taking ... like wandering down to the beach to take penguin footprint photos (nope - did that this year). What a team - even despite the changes to our perfect strategy from 2015, we still nailed it going only 3 minutes slower than last year. Kim is quick to point out that, according to her GPS watch, she was not moving for 18 minutes of the race, and so if her support crew had been more on the ball - it would have been a P.B. (actually what was a bit frustrating is that she wasted 5 minutes getting into the female toilets at Allonah because other people (not solo racers) were using it). Bit of a bummer (no pun intended) missing out on a P.B. beause of a loo stop. We'll make sure there are none of those next year!